Some lies you just can’t come back from. The damage is too deep. The effects are too strong, and the path they lead you on can be devastating. One lie only led to another as Lindsay tried to be someone she wasn’t. She wanted just one moment to pretend she didn’t live the life she had been cursed with. She wanted to live without regret. Live for the moment. She wanted to laugh and smile without feeling as if at any moment something or someone would corrupt that happiness.But all lies have a way of resurfacing. Those deceitful words can come back to haunt you, leaving you as the one heartbroken and alone. Zack had taken a trip with a fellow Navy SEAL. Just a weekend away to regroup.Never had he intended to find the girl who would jumpstart his heart. Only then to destroy it. But the shattered pieces of his trust weren’t the only things he left behind when he walked away from Lindsay.There was now an innocent life that had been thrown in to the mix. The odds were stacked against them.There was someone doing everything they could to keep them apart. I was so engrossed that I finished within a couple of hours. 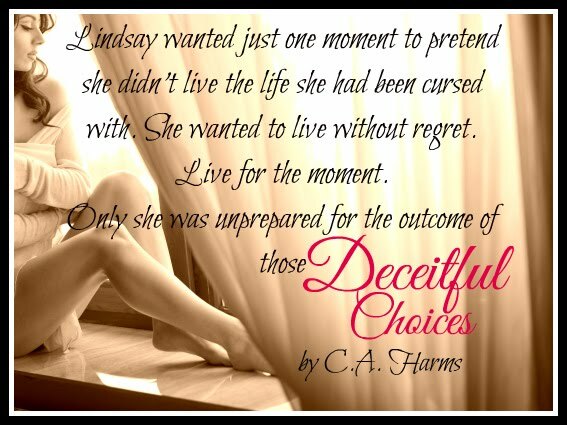 Deceitful Choices is an engaging read that’s full of emotion. CA Harms draws you in through her writing without a doubt, which is why I couldn’t put it down. This book is fast paced and really pulls at your heartstrings. Zack comes off a bit arrogant but I really liked him and what he stood for. He made quite a few choices that I can’t say I agree with but I liked who he was when he interacted with Lindsay and his family. Lindsay had a rough life growing up and my heart hurt for her. I was able to connect with her on certain levels. She made a way for herself when the odds were stacked against her. She was a bit too naive though. I feel like there were situations in the book where she should have known better than to fall into the trap that was laid before her. I also felt as if Deceitful Choices was a bit predictable. The villain wasn’t very believable and was like a fly that wouldn’t go away, just annoying. I usually like the villains because I feel like they’re just a necessary evil but I just couldn’t get into this one. Overall though, I enjoyed this book and I look forward to what CA Harms comes out with next.